The San Ramon Valley Unified School District on Thursday confirmed yet another incident of racist graffiti at one of its high schools. It is the fourth incident in the district this school year. The latest graffiti, at California High School in San Ramon, came on the heels of racial scribblings found in a boys bathroom Wednesday at Monte Vista High School in Danville. Concerned Monte Vista parents showed up for a meeting Thursday night. Many of them were emotional, sending the message that racism will not be tolerated in the school district. "This is not OK," one parent said. "It is unacceptable; it will not be tolerated." 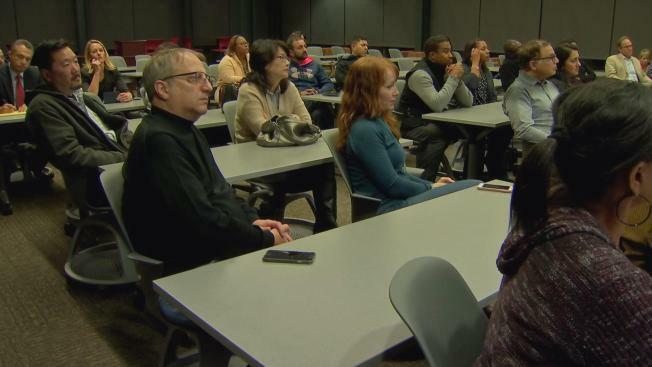 The meeting in the school library was filled with with grim faces as the subject of racist graffiti on the campus set an uncomfortable tone for almost everyone. "My kid was directly affected by it and brought me into it right away," parent Lalene Shepherd said. Shepherd’s son was one of the students who found the words "Whites" and "Colored" written above two urinals on Wednesday. School district officials the California High incident was similar to the Monte Vista one. Both incidents have been reported to police. Some people are blaming the political climate around the country. On Thursday night, Monte Vista parents wanted to hear from the principal. "You could have a great school climate, but it doesn’t mean anything if people are walking around the school feeling unsafe," Principal Kevin Ahern said. Three of the four incidents have occurred at California High, and one student at Cal High has been disciplined in connection with one of the previous incidents.